How Much Does Slate Flooring Cost? Prices are on a square foot basis and do not reflect total cost. How to Install Slate Tile: DIY or Hire? Picking the perfect flooring for your home is a dizzying process. There are many popular styles, each of which has its share of pros and cons. Thanks to fine-grained materials such as quartz and mica, slate flooring offers a high-quality look that's still durable enough to be waterproof and stain-resistant. It can withstand heavy foot traffic as well as any other flooring solution on the market. Because slate flooring keeps its overall appearance after years of being walked on, it's an ideal long-term flooring option. Here's a guide to the types of slate flooring, their expected costs and how to install them. Pricing for slate tiles varies by vendor and fluctuates depending on your location, but usually ranges between $4 - $10 per square foot if you plan to install it yourself. Professional installation increases the average cost to between $9-$20 per square foot. Sizing is obviously a major factor to consider, since you'll pay more for larger pieces of material. You can buy slate tiles for as little as $1.75 per square foot at Lowe's, but on average you'll pay $3.50 per square foot there. Lowe's stagnant price tiers mean the most you should expect to pay is around $4.50 a square foot. Home Depot offers a larger range of slate tile products. They also offer some of the cheapest options available, starting at only $1.49 per square foot. Their average price is roughly $4 per square foot, and the more expensive slate tiles cost up to $7 per square foot. If money isn't an object for your project, you can even buy very high-end slate flooring materials at $15-$21 per square foot. Conversely, if you're on a budget, consider purchasing by the case. That's 10 square feet of slate tile for a set price. Home Depot sells some of their most popular slate tiles for $30 per case, which makes estimating your project's total materials cost much easier. If you plan to hire an installer, you'll pay for the demolition of your current setup, the installation of the new tile and the post-tile cleaning process. If your job site requires any construction for the project, it won't be included in the quote unless you ask for it. Expect to pay $10 to $15 per square foot for a professional install if the materials cost you $3.50 to $4.50. When choosing who to hire for the job, pay careful attention to company reviews on social media sites. Installers with consistently high marks for their work justify a higher quote. Due to its popularity, slate tile is available in an array of colors. You can stick to basic colors such as copper, gold and checkerboard white or branch out with much more exotic options. Vivid palette descriptions include Mongolian Desert, Midnight Flurry, Snowcapped and Coastal Redwood. Whether you prefer rustic tones or dignified, muted offerings, you'll have plenty of slate tile style options to choose from. With the exception of some stylish pieces, standard tiles come in 4-by-4-inch, 6-by-6-inch, 12-by-12-inch and 16-by-16-inch squares. You can also buy them by the slab if you prefer to do the cutting yourself. Tile patterns and the layout of the area you intend to tile will directly determine the size of the pieces you must purchase. One-tile patterns feature no inlaid pieces. Instead, each small tile is placed sequentially and usually in a straight line. Because all the pieces are the same, the placement determines the overall look. Two-tile patterns use a pair of different-sized tiles to craft a diverse look. You can incorporate both the windmill and pinwheel patterns described above, since they use identical square and rectangular pieces. That's the underlying concept of multi-tile patterns; the name reflects the number of different sizes and types of tiles in the pattern. Three-tile patterns add a third tile size. Multiple tile patterns use more than three tile sizes and offer the most diversity if you want an elaborate floor design. You can use styles such as interlocking, modified hopscotch, Versailles, kaleidoscope and many others to spruce up your flooring. But these aren't the only tile patterns to choose from. The one you're likely to see the most is a backsplash pattern. It's usually a type of grid or diamond pattern with or without a border surrounding it. Some of the same patterns above, particularly windmill and pinwheel, double as great backsplash patterns. Generally, these patterns are not as complex for flooring due to space limitations. 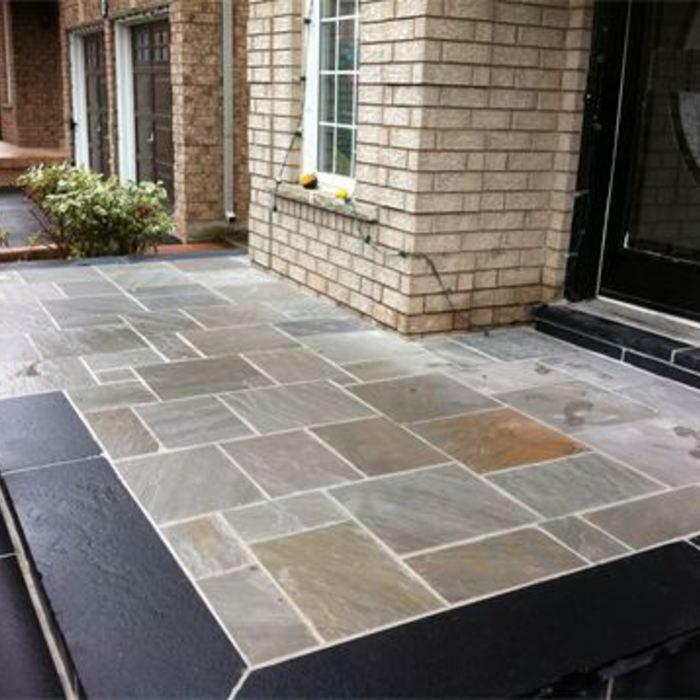 Similarly, outdoor flooring usually limits slate tile options, because the surrounding terrain will impose limits on what you can and can't do. There is a trio of major slate tile brands: Roterra, Cabot and Janeiro. Roterra has the largest presence at stores such as Home Depot, Lowe's and BuildDirect.com. Their slate tiles are quarried at mineral-rich sites in China and India, guaranteeing high quality at a low cost. They also offer one of the largest color palettes of any manufacturer. Cabot is growing in popularity due to its prevalence online. BuildDirect.com, in particular, carries a large supply of Cabot products. They, too, quarry their materials in China, and contractors praise Cabot for its tiles' rigidity and durability. Cabot also receives acclaim for its robust line of colors, many of which are exclusive to the company. They prioritize novel tile design, and it shows in their product line. As its name implies, Janeiro quarries all its materials in Brazil. Janeiro's pieces show great attention to detail, and builders generally regard these tiles as the most precisely cut with the smoothest edges--important details when you work with pieces often. Some of Janeiro's tiles are as basic as can be, while others are some of the most novel in the industry. So if you're in the market for something either highly eclectic or very basic, it's the brand to consider. If you're seeking something more middle-of-the-road, Cabot and Roterra are likely better choices. 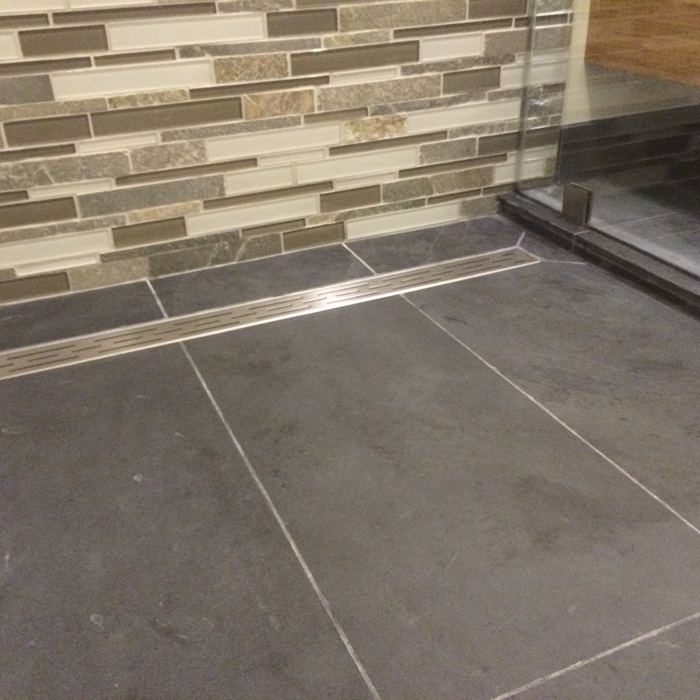 Installing slate tile is something you can do on your own. If you prefer to hire a professional, be sure to ask about all the specifics when you get a quote. In addition to the cost of installing the tile itself, you'll want to make sure the estimate includes grouting and sealing the tiles. Most professionals include this in the cost per tile, but get the quote in writing to protect yourself from hidden charges. Also note that many professionals quote higher prices for small areas. This is because of the challenges associated with working in tight spaces. The installer charges more to compensate for the extra effort. It's conceivable that a narrow hallway or small bathroom tiling project could cost as much as a significantly larger open space. Overall, an easy project that requires little tile cutting to fill a wide area could cost as little as $5 per square foot. Conversely, tight quarters or a tricky floor plan could cost around $15 per square foot to install. Remove previous flooring, if applicable. Open the area down to the subfloor, and remove any protrusions such as screws and, especially, nails. Otherwise, they'll present a constant source of danger during the install. Make sure the tiling region is flat. If not, you'll want to level it with concrete leveling mix. If you're working with wood, check to see if the floorboard squeaks. If so, you must flatten the boards to ensure it doesn't become a long-term issue after you install the tiles. Clean it meticulously with a broom and then a vacuum. Anything you don't remove before installing the tile will remain trapped there, so your workspace must be flawless. Apply an eighth to a quarter of an inch of mortar on the subfloor as an adhesive element. Then, install pieces of backboard on top of the subfloor. Note that mortar won't hold the structure together on its own. You'll want to tether the pieces together using a series of screws. Check each tile carefully for damage before beginning. Then, do a dry installation of your tiles. The purpose here is to check that everything looks right before you reach a point of no return. Plus, you can take measurements for the work you're about to do using the actual pieces. Employ spacers to create the requisite gaps between the pieces. That's where you'll have spacing in your design. Cut the edge tiles based on the measurements above. It's imperative that you get these numbers correct and then cut as directed. Otherwise, you'll waste the tile. Finish the dry run by removing the edge tiles first. Consider numbering them on the back to eliminate the risk of forgetting the placement order of the pieces you just cut. If you're using a complex tile pattern, rearrange the non-edge pieces until you find the design you like the best. Then, number all the pieces on the back. You're now ready to begin placing the tile, which is actually the easiest part of the process. Head to the region farthest from the door. At this point, make sure you have a bucket of water and a sponge, your mortar and patching tools within reach. Apply a generous supply of the adhesive to the intended area. Flatten it using your patching trowel. Begin to place the tiles, paying special attention to the numbered ones and placing each piece in the right order. Use the spacers to create a buffer between the pieces. When you're confident that everything is correct, start pushing down piece by piece to place the tiles in their final resting spots. Check to see if any of the adhesive mortar has leaked onto pieces of tile. If so, use the water and sponge to clean it off before the adhesive dries. Be careful not to put your full weight on any of the tile, though. It won't have the tensile strength to support traffic for another day or so. Remove the spacers and wait for the adhesive to dry. You're almost done! Use a water sealant on the outer edges of all the connecting tile pieces. Then, add grout into the joints, and your new floor is ready to use. Wipe any substances from the tile before they can dry. Slate tile is one of the best choices you can make when it comes to your flooring needs. It's durable, fire-resistant and aesthetically pleasing. Choosing the right slate tile for your needs is a bit trickier. You'll need to weigh your choice of colors, sizes, patterns and manufacturers before starting your project. After you've selected a standout slate tile, you then have to determine whether you're up to the challenge of installing it yourself. A professional will handle the job effectively, but the project's cost will increase. If you prefer to install the flooring on your own, use the steps above as a resource to craft the best-looking floor in your neighborhood. Whichever route you choose, you'll boost your home's resale value by adding these high-quality materials.